I live in an old two-story house in Cutler, which has high ceilings and is filled with light year round. I use two rooms upstairs. One I use as an office and for framing and storage. The second faces the harbor, which makes it perfect for painting and studying the fishing boats, crows, and seagulls that constantly move in and out of my view. 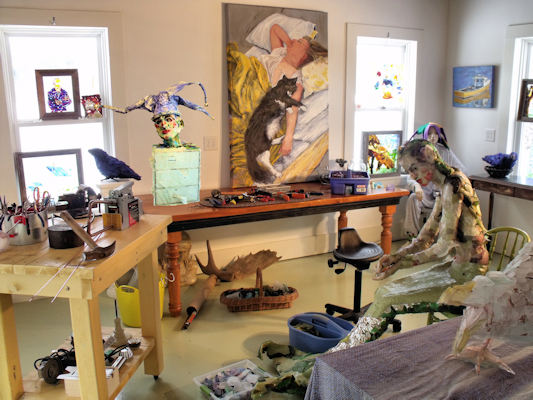 I have two rooms downstairs where I create sea glass and recycled glass windows and sculptures. One room is filled almost floor to ceiling with containers of glass. The other room is where I work. In the past I have tried to use just one space, but working with welding equipment, anvils and hammers, and grinders doesn’t work well with canvas and paints. I make a mess in all of these rooms when I am into a project; however, I have an organized side that drives me to do a major cleanup once a week. I’ve been working on a series of large diptychs. I like to keep my workspace as simple and uncluttered as possible so that my focus can be on the image itself. 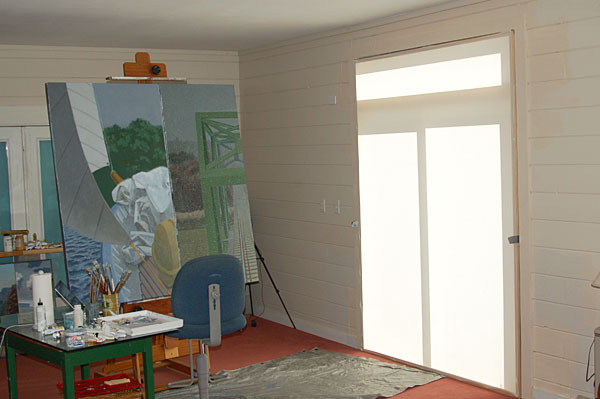 Recently, taking a cue from the south-facing Paris studio of a painter I admire, Georges Braque, I installed a big slider on the south wall of my space and constructed a single insert with a sheet stretched across it to evenly diffuse the direct winter sunlight. In the summer the sun is high enough overhead that I can set the insert aside and enjoy the view into my backyard. 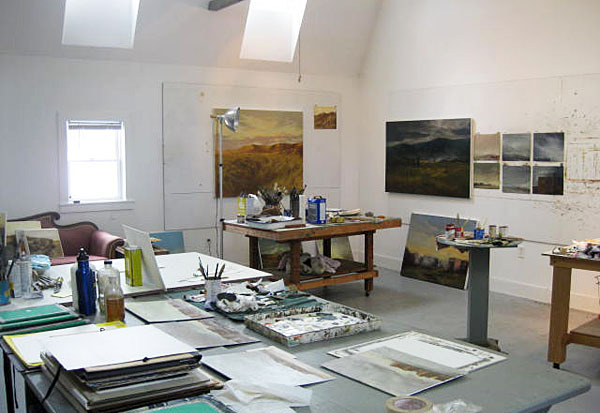 The light lifts my spirits because it is much warmer than the typical steady, cool north light of most studios. I am currently using hand-painted newsprint as my support, on which I print and re-print images using a 44-inch Epson archival printer (this is not suitable for everyone, as you must be good with mechanical problems when using a printer like this). I usually mist the 33×38-inch print with water to force the inks to run. When the paper is dry, I gesso over it lightly and re-print the image. I work this way until the composite seems to be finished. This may take several days to a few weeks. I build a 30×30-inch stretched canvas, trim the newsprint to fit, and, using acrylics, glue the print to the canvas. I use acrylic gel glazes, pencil, gesso, and sometimes stencils to finish the piece. My studio is a new extension of a large gambrel barn built in 1934. Six hundred square feet of floor space with a 14-foot ceiling is a perfect combination of dimensions. Painting walls are faced with Homasote. Excellent light comes from skylights and overhead directionals. Work tables and large palettes are mounted on casters. The opposite side holds flat files and storage racks. This is where I filter thoughts and dreams, realities and fictions. It is home.